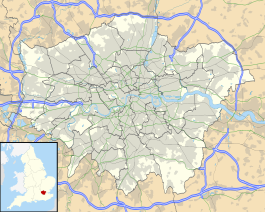 Headstone Lane is a railway station near Headstone, in the London Borough of Harrow. The station is in Travelcard Zone 5. The typical off-peak service is three trains per hour to London Euston, and three trains to Watford Junction, calling at all stations. The trains to Watford Junction are northbound and are accessed through a gateway and by going down a flight of stairs, whereas the other platform is southbound and is directed towards London Euston. This is accessed by crossing over a bridge and also going down a flight of stairs to reach the platform. On the northbound platform, there is a gate exit which now has an Oyster reader, so passengers can exit through the gate without having to climb the stairs. There are also Oyster readers at the main entrance at the top of the bridge. During the Silverlink era, the gate was rarely opened - however in recent times, London Overground always leaves the gate open. The station was previously also served by the Bakerloo line of the London Underground between 1917 and 1982. Since the takeover of this station from Silverlink to London Overground the ticket office opening hours have significantly improved and two ticket machines have been installed which now offer Oyster Cards facilities, card payments are also accepted. London Buses route H12, H14, H18 and H19 serve the station. Wikimedia Commons has media related to Headstone Lane railway station. This page was last edited on 15 April 2019, at 21:27 (UTC).